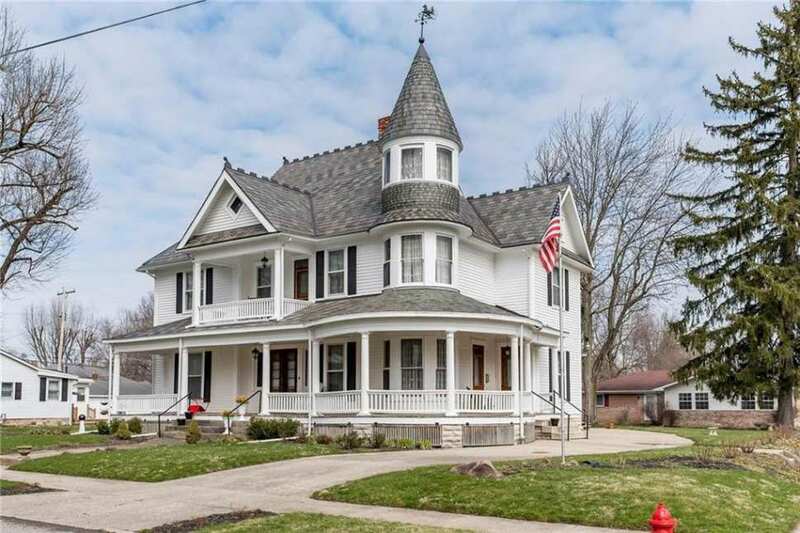 Oh, how this beauty cries out for a period-correct exterior color scheme. Many of the gas/electric ceiling fixtures have the electric arms facing UP. 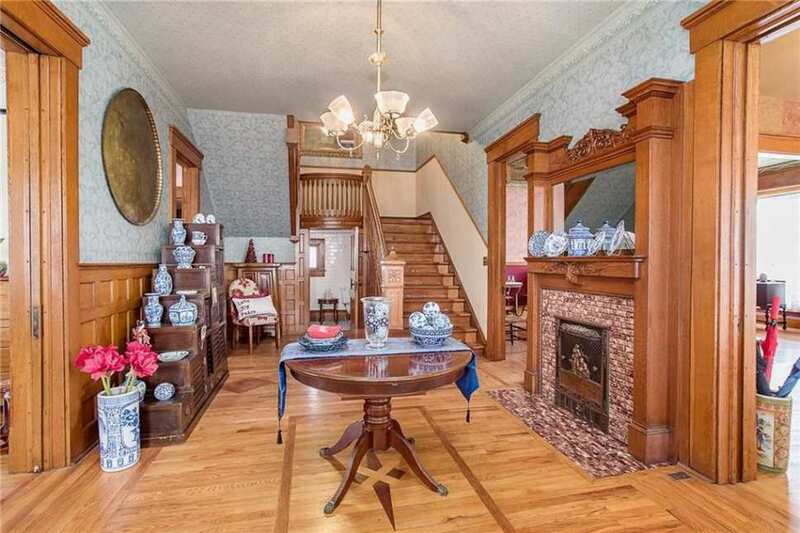 These would normally face DOWN, as can be seen with the dining room chandelier. It’s also curious that many of the gas shades are missing. These are not hard to find on eBay. 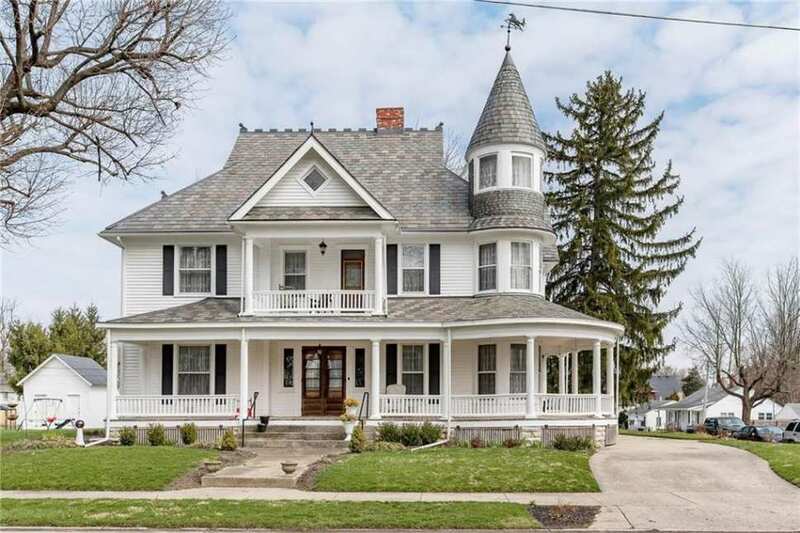 I agree that this would be even more stunning with period-correct exterior colors. I was also curious about the light fixtures. They just didn’t seem quite right, although it’s certainly good to see that many originals still in the home. I’m now quite curious about the taxes. They are incredibly low for this much house compared to most places I’m familiar with. What a deal! 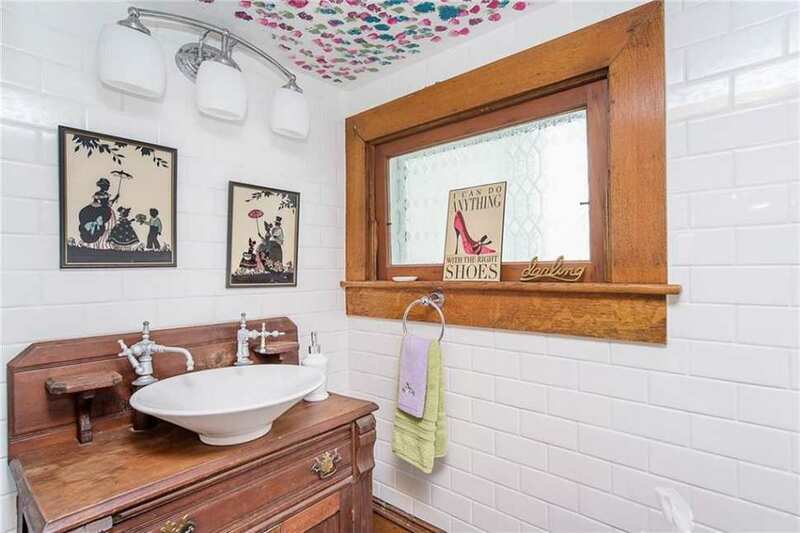 The very first thing I would do upon closing is flip all those arms down…I see houses with combination fixtures assembled incorrectly all the time. It drives me to drink! 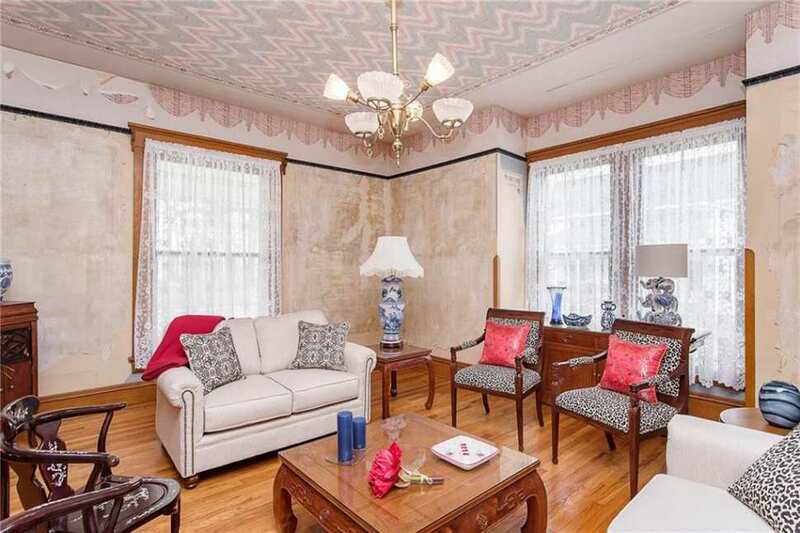 Looks like someone else started to rip off wall paper in front living room. The house is beautiful. I love the fact that there is roof ridge cresting! Absolutely. 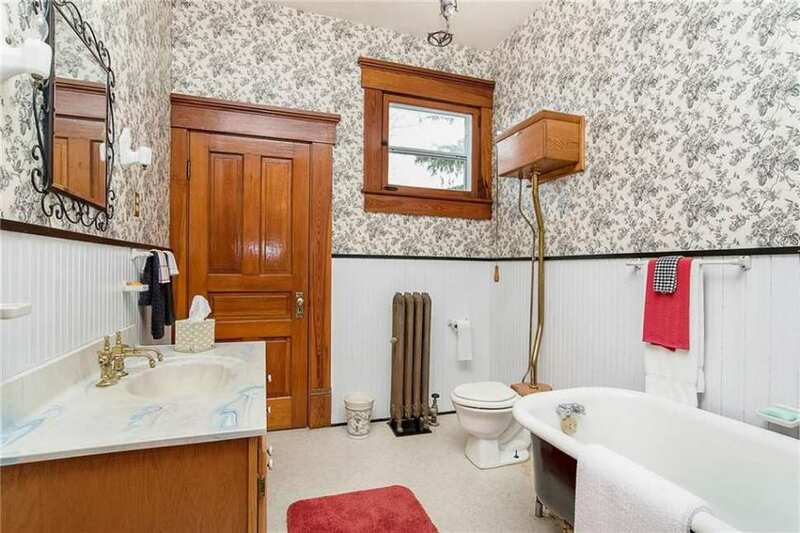 The internet is FULL of photos of correctly positioned/appointed gas/electric fixtures. Love this house! This is about the only type of restoration I can do anymore. 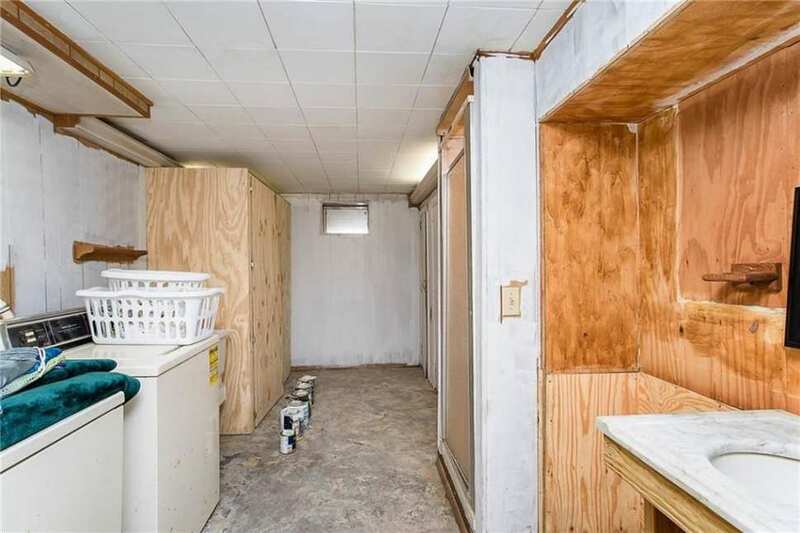 Remove some wallpaper and repaint some walls. Love the woodwork. 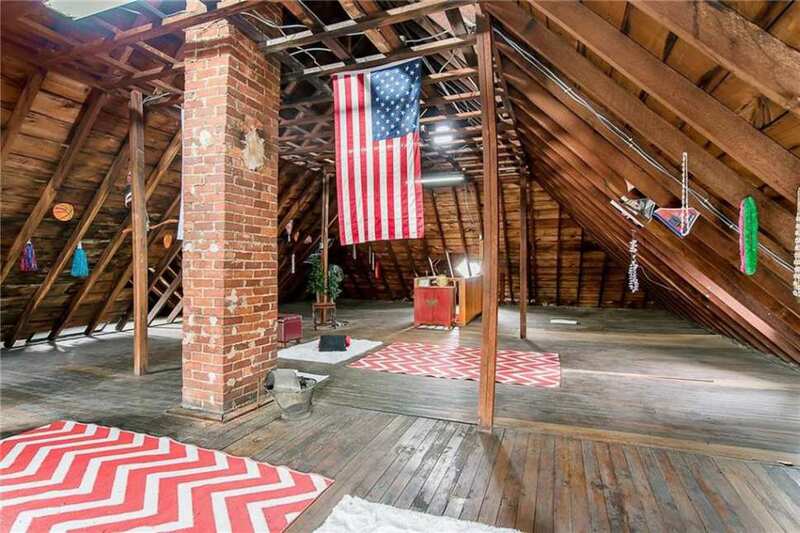 I love the attics in these old homes. Absolutely huge and crying out for some gym equipment! Can you imagine carrying gym equipment up all those stairs! Of course I can also imagine rocking out to AC/DC while on an elliptical! Now, THAT’S my kind of workout! Loud AC/DC and open space! This is located in a nice little Midwest town but near several larger towns, including Indianapolis. 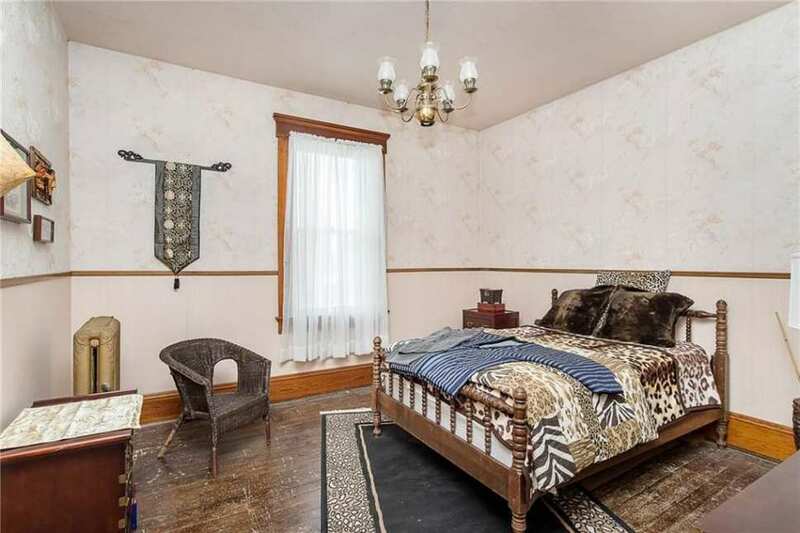 Although it appears to be well maintained, the wallpaper may be what’s holding up a sale. 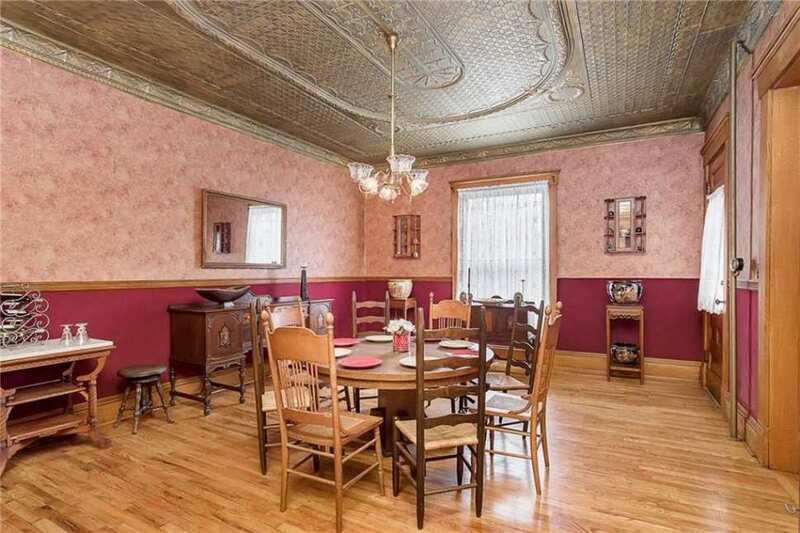 It must have taken someone with a very good neck to put it all on the ceilings (something popular in the 50-60s.) The thought of removing it all is daunting. Aside from taking it back to it’s roots, I really can’t see what it hasn’t sold. 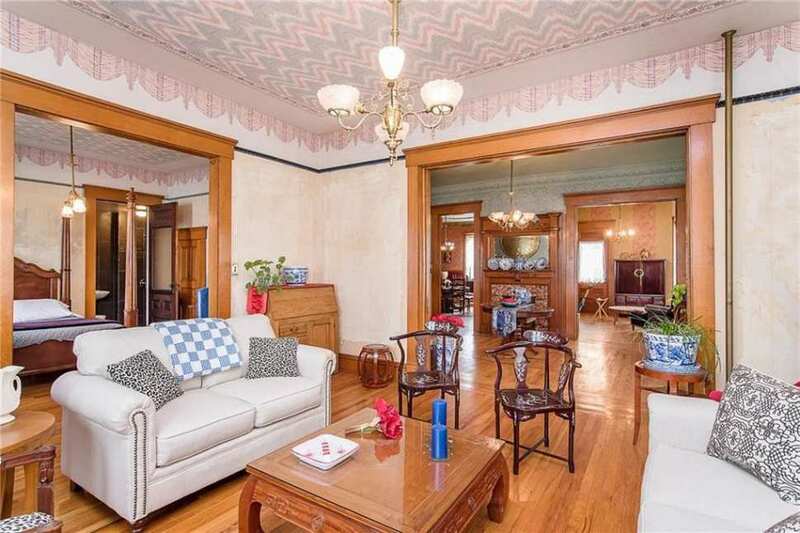 This home appears to be another example of a George F. Barber design. Now before you all jump to any conclusions like “Chris has really lost it, this time”, hear me out on this one. So, because I think you all will need to be convinced, you may want to click on this link and open it in a separate browser window, so you can compare the images there, to the photos posted here on OHD. Here is the link to the published design by George Barber. 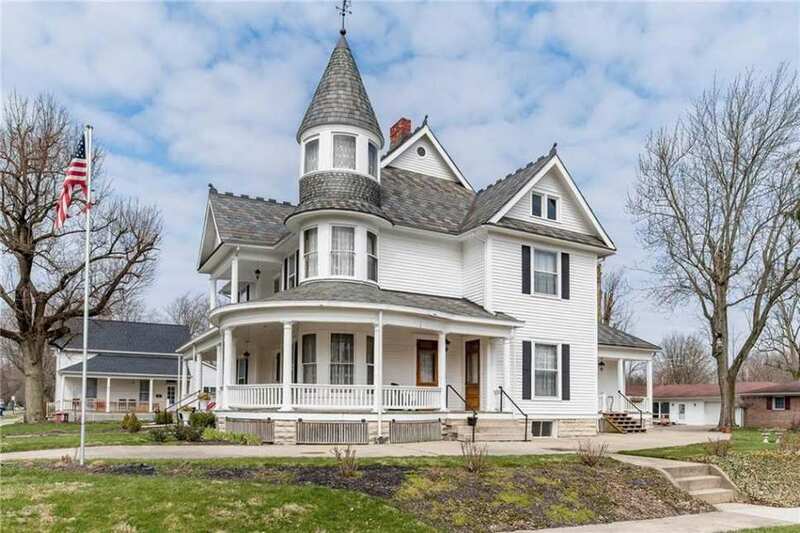 First, the exterior of this home has a general similarity to Barber’s illustration of his design. 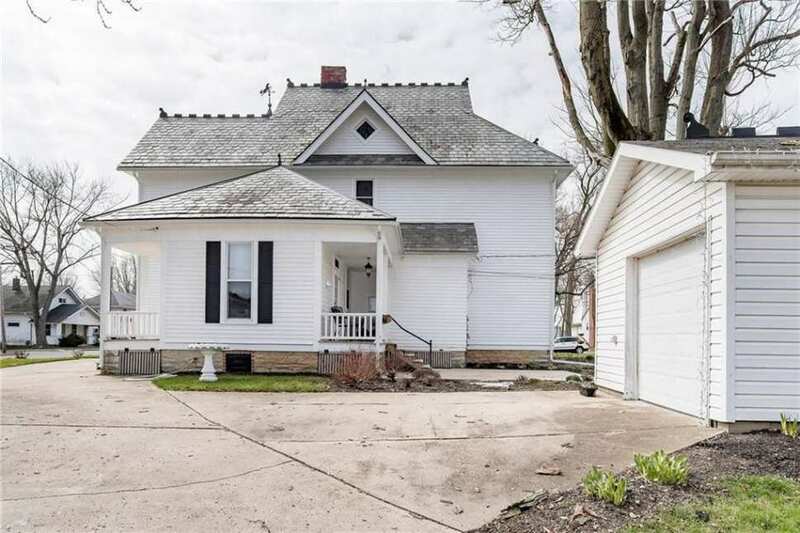 And yes, I see that the Pavilion is not here and this home’s fenestration is now more modernized than what it might have looked like originally, but I do see many similarities as well. Then, if you move into the interior of the house, you will see a layout that pretty closely matches Barber’s published first floor plan. 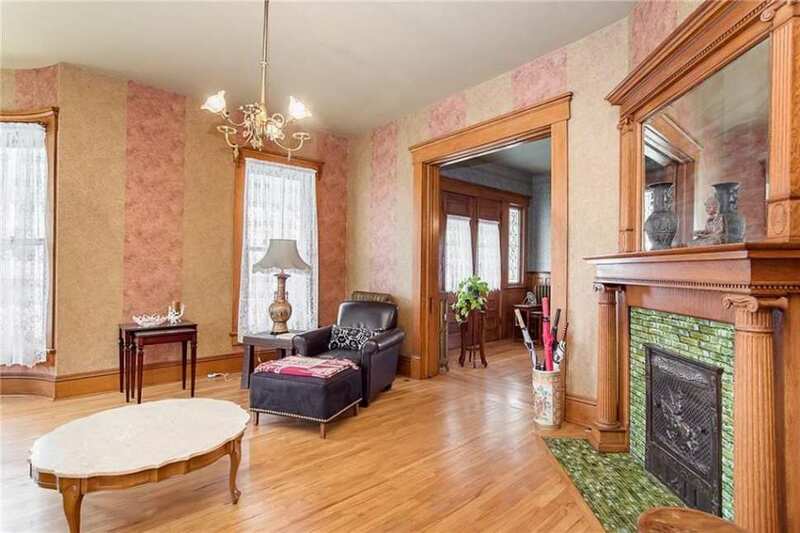 Things like the room layout featuring a bedroom off the front sitting room, the central fireplace that faces the stair Hall, the Parlor, and possibly the Dining room (there is no photo of that corner of the Dining room), and the staircase itself, featuring that curved balcony at the landing, are all consistent with Barber’s hand, and this published design in particular. And although this home is not a spot on match, we all know that Barber often customized his designs to meet the individual desires of his client. So the differences shown here in the photos are likely just those design customizations, as desired by the original owners. Anyway, this is just my humble opinion, so feel free to express yours. This house, by the way, is the John W. Hedrick residence and it is listed on the national register of historic places. Hedrick was a successful farmer and natural gas prospector. I see it Chris. 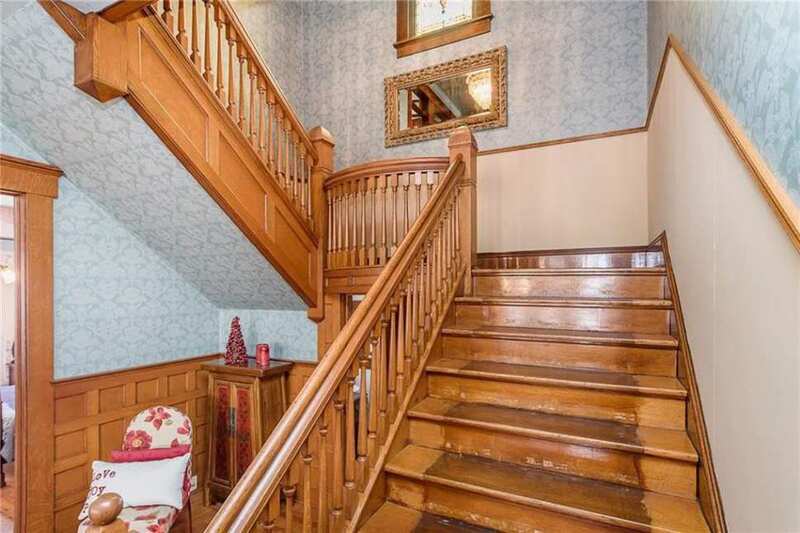 The one really substantial variation, which you did note, is the front stairway. 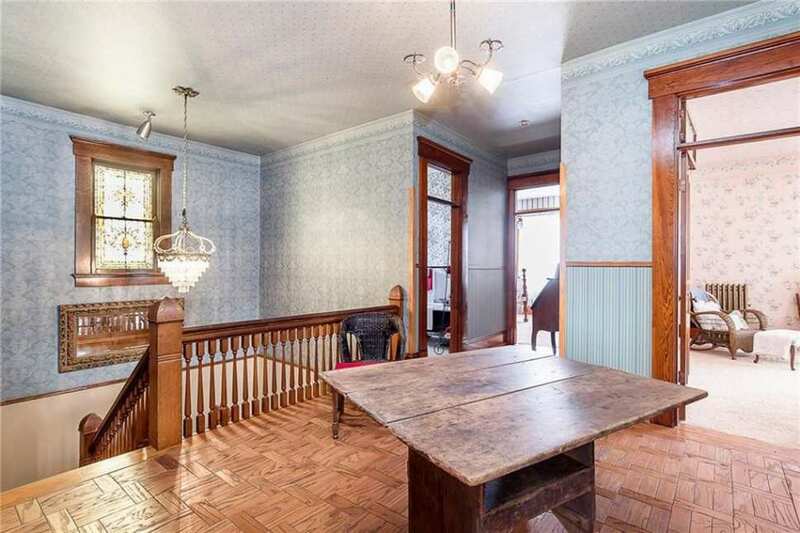 I also agree with you that the extant stair design can easily be found in other Barber designs of this later period. Seems to me the original owner (‘s wife) probably told the builder they wanted “this one, just without all the fussy and frilly bits like in the old style; and we want that more prominent stairway from THIS design.” I’m sure you’ve seen plenty of these somewhat altered Barber designs with bits and pieces added and or omitted in your years of studying the ones you can identify. I can clearly see it now that you pointed it out. 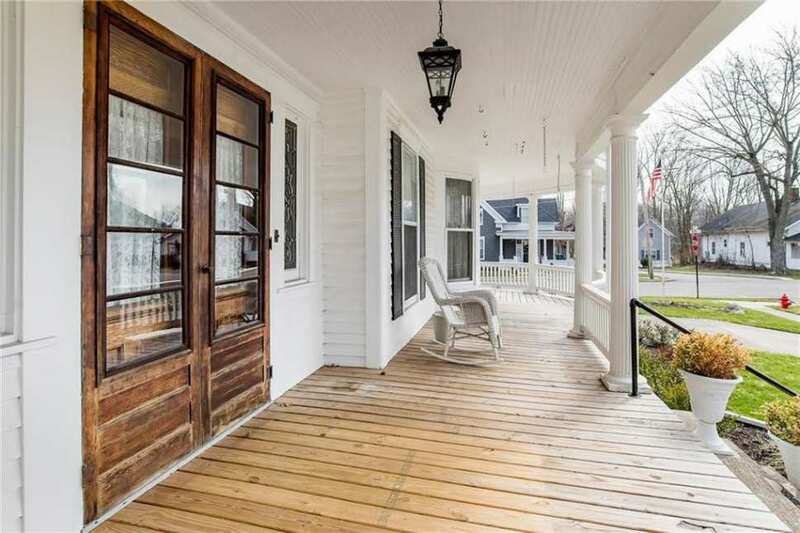 Even the porches on the rear of the house are close to the original. Good eye, Chris! My parents live in this town. It has probably not sold because the area is economically depressed without many job opportunities. Pretty house. A lot of people are upset over the arms on the light fixtures. 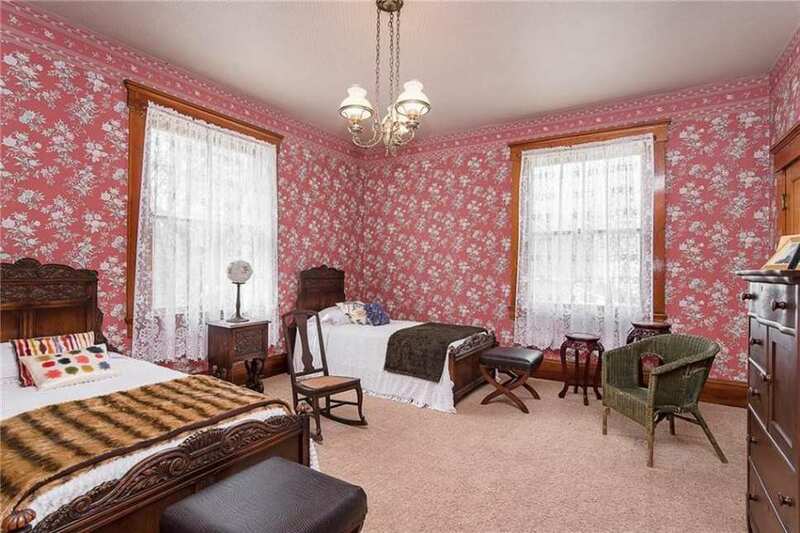 I get being period correct, but as the owner of a Victorian home myself, I go for what looks good to me now. 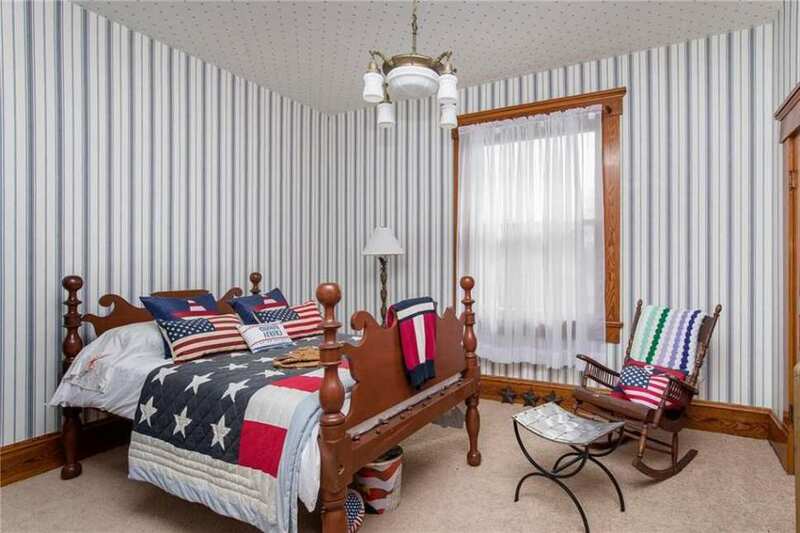 I have gorgeous chandeliers, but got rid of the period fixtures because they were ugly. 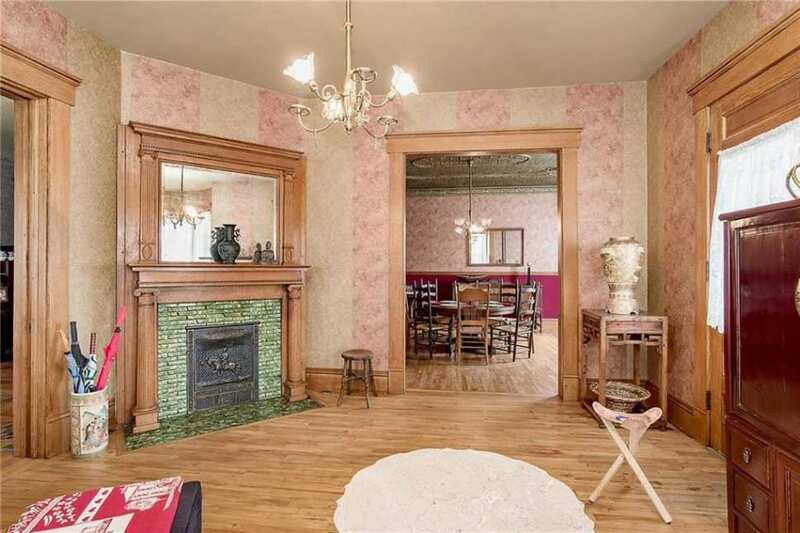 If I am paying thousands of dollars to own a home, I want it to make me smile every time I look at it, and not just be “period” correct to historians. Yes you as a homeowner can do whatever you would like because you’re paying the bills. 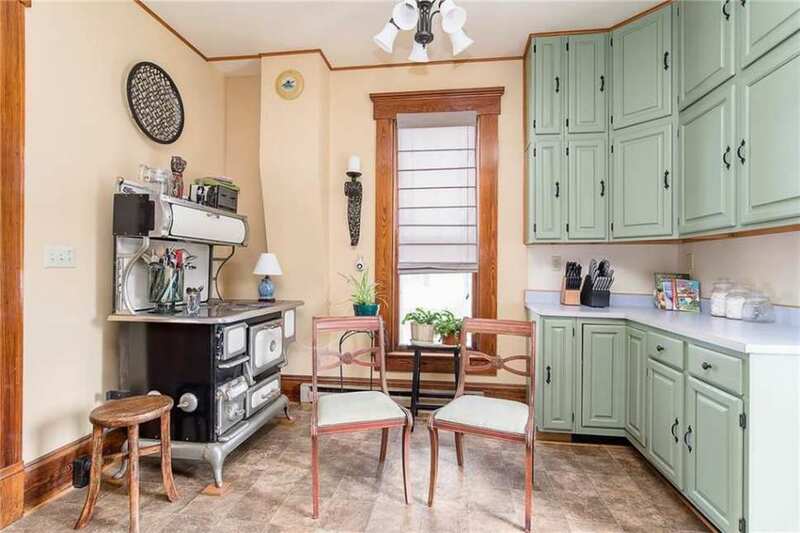 I’ve had some ugly or boring original features in a home that I had to change or remove because it didn’t work for me. That’s what we do at the end of the day. In my opinion, if something like this can be done or undone to suit taste without destroying the item then so be it. 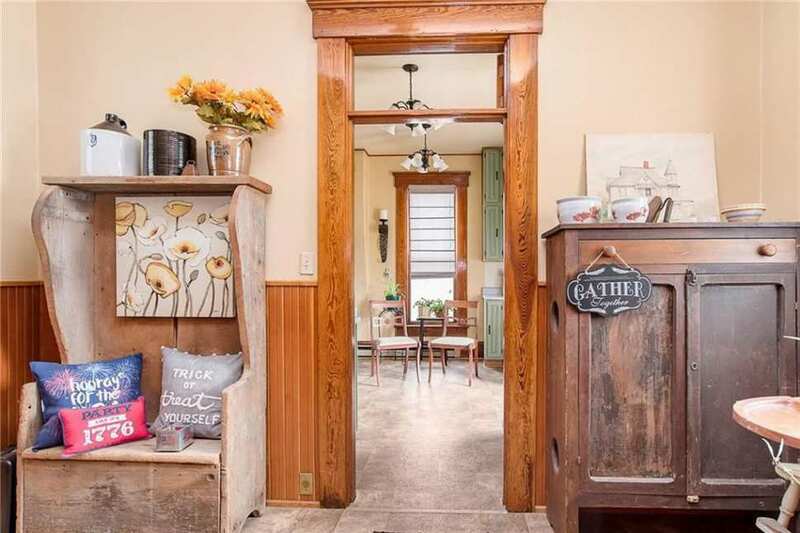 But things like, taking doors down and throwing them away instead of putting aside or tearing out all the walls to make an open floor plan, is a bigger problem to undo. Historian, old house lover etc. 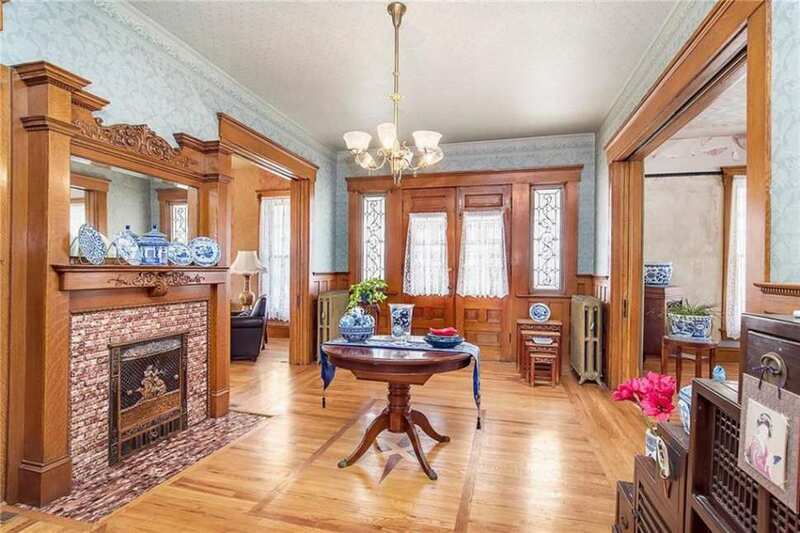 But in the end, Historic house lovers will always point out areas where something has been made unauthentic. Its what brings us all together on these sites. The same as an antique collector or seller will be quick to let you know what you or someone else has done to a piece to reduce its value. In this case, it can be easily undone by turning down the arms. Both of you make really good points. Well said. I agree that that the up/down on the old fixtures is a bit nerdy, though gorgeous/ugly and “make me smile” bother me more. Certainly you have a right to do as you like to your home, but original and authentic will never change while ideas of what is pretty or not will blow like the wind. 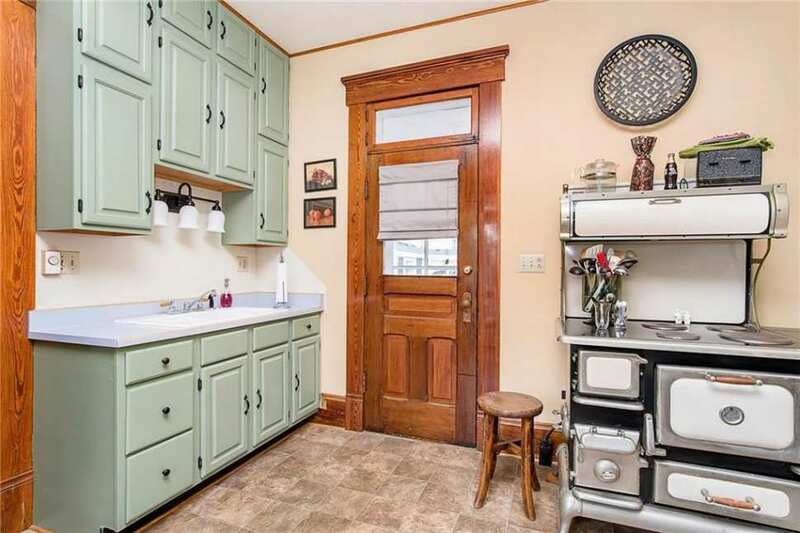 Even the most tasteful changes of fixtures and details may quickly become dated, and the original lost and forgotten. 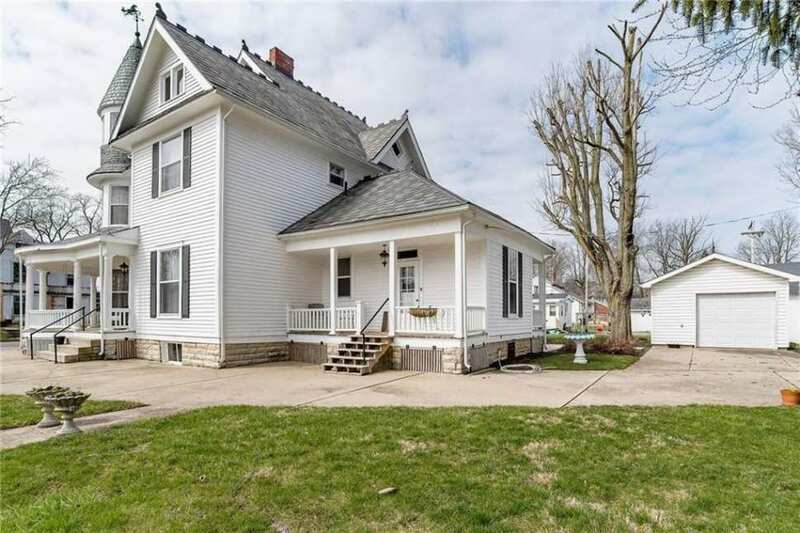 This house is no “bad penny”; but it surely qualifies for the “comin around again” club of houses we’ve seen reappear the most over the years; whether due to turnover of owner, or listing. 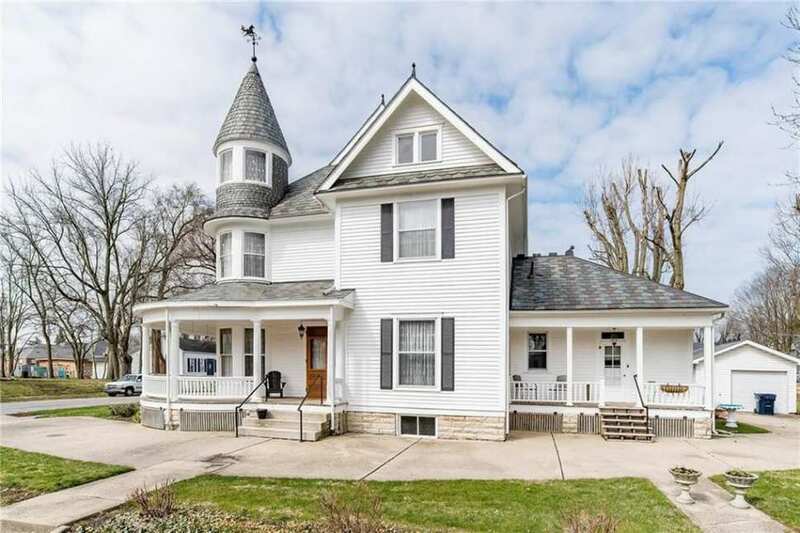 Its a really great, spacious house in a very nice, tidy, quiet little town just a tad farther from the Indy metro than folks are willing to daily commute: for now. Get in early, and relatively cheap, before that’s not the case any longer. I can see it, Chris. 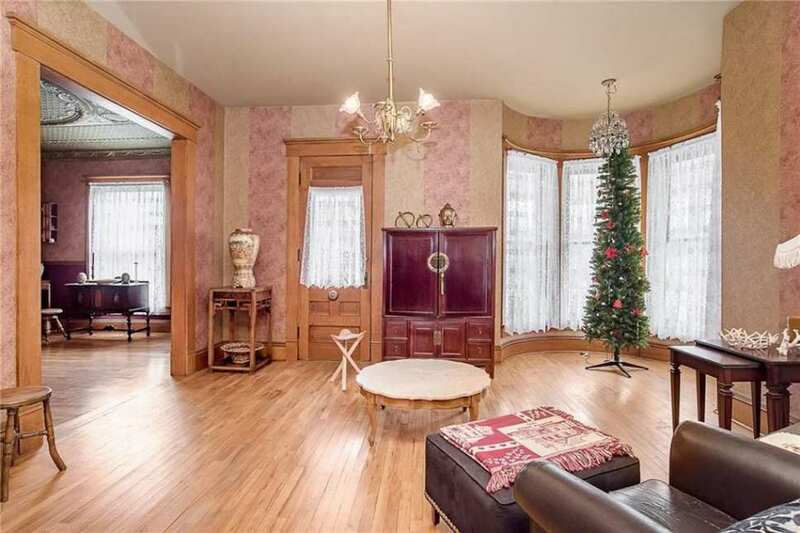 This is just a lovely house! 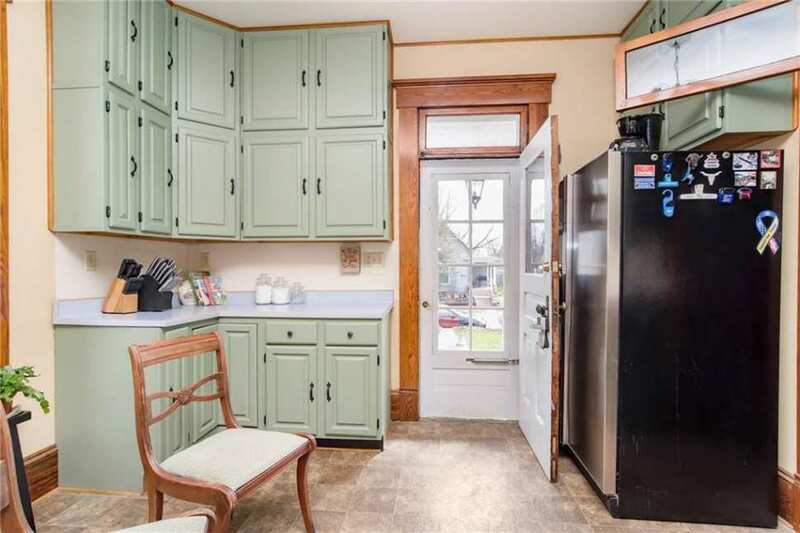 I have to say that I love the kitchen cabinets. I know that it isn’t period correct, but it’s just really pretty to me! 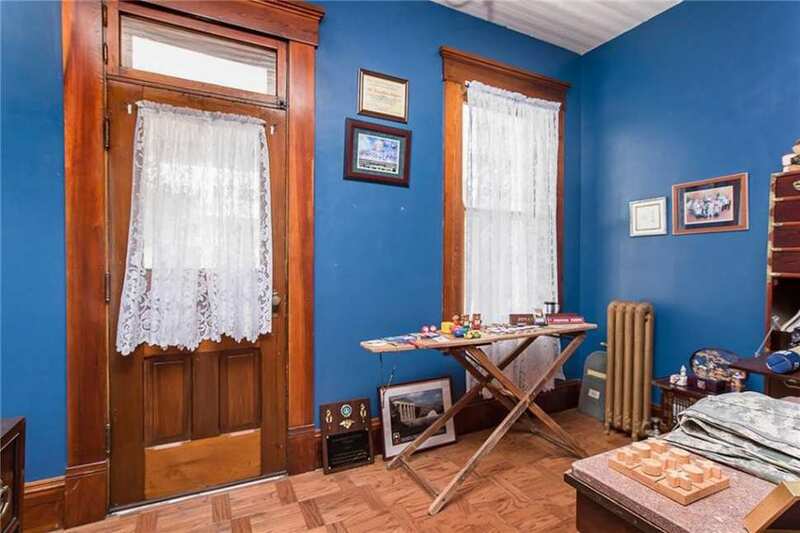 Lovely house, but during that period, they didn’t paint the interiors. 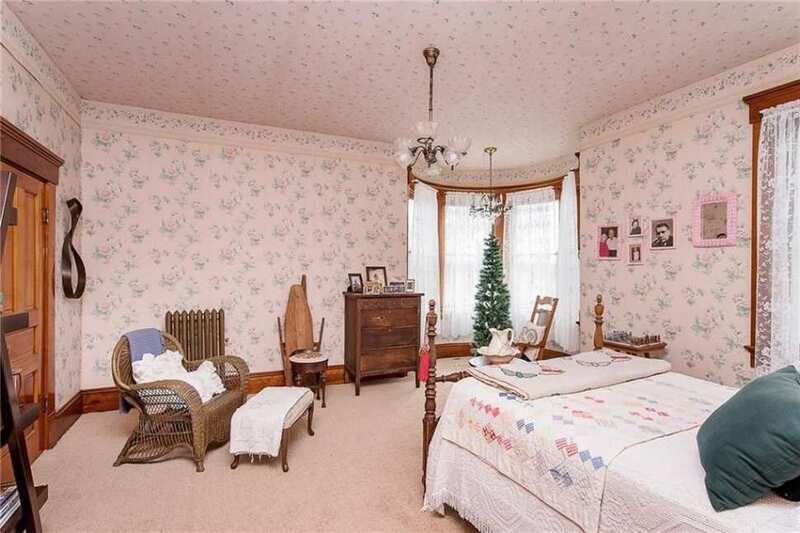 They wallpapered them, ceiling and all. 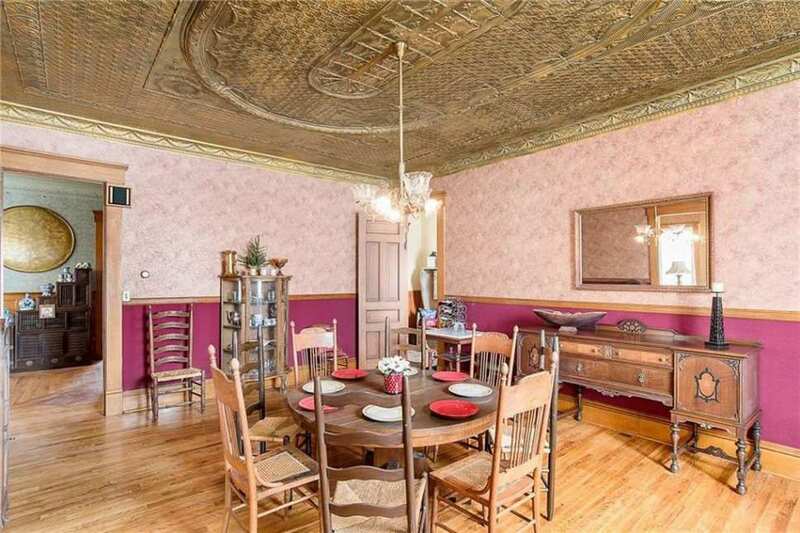 With that said, I can see the current wallpaper removed and period paper hung-ceilings in the formal rooms at least and the dining room ceiling is fabulous! I noticed some issues with the wallpaper stripping as well, but I’d strip it all off anyway and start over even though it isn’t hideous as it is. I just like the turn of the century style better. I also agree with Chris DiMattei that this is a Barber design. He did customizations as our last house was also a Barber but there was some customization done to it also. CLM, I agree with your comment about wallpaper. 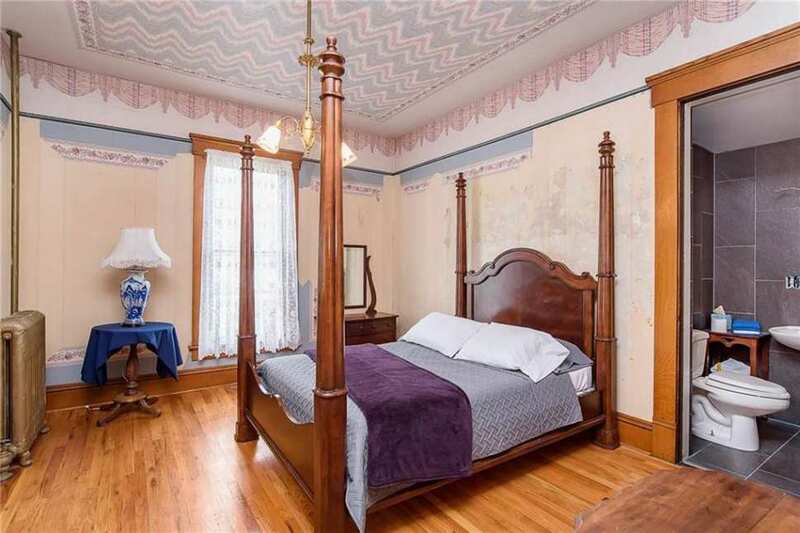 My husband and I recently purchased a 1920 Foursquare, and all the rooms are painted….it is crying for some period-appropriate wallpaper, which is what I am going to do.